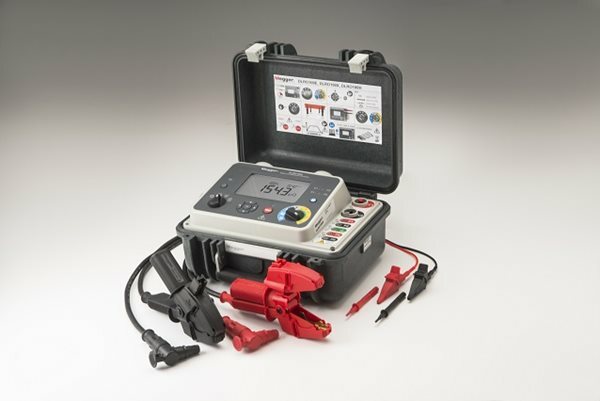 Norristown, Pa. February 2017 – Megger has enhanced its line of 10 A digital low resistance ohmmeters (DLRO) to include the DLRO10HDX. This new ohmmeter records tests and has onboard memory storage for up to 200 test records. This DLRO is ideal for use in applications ranging from railways and aircraft to resistance components in industrial environments. Powered by either a rechargeable battery or an AC power supply that makes it suitable for continuous testing in production lines or repetitive use environments, the DLRO10HDX combines the simplicity of operation with a rugged IP65 case that is designed for stable ground and bench operation. Megger’s DLRO10HDX features five test modes with auto start on connection. Each mode can be selected using a rotary control on a mode selection switch. This easy-to-use switch can be operated in all weather conditions and while wearing gloves. 2.5 Ω. Tests can last up to one minute. The rugged DLRO10HDX features a large, backlit LCD display that is easy to read from a distance, as well as a simple control panel that enables easy navigation for configuration settings. All memory functions of the ohmmeter, including delete, download to PowerDB and recalling test results are accessible via the range selection rotary switch. Interchangeable test and termination leads come standard with each unit. The unit is protected to 600 V without blowing a fuse and features a test lead live voltage warning light. It is also rated at CATIII 300 V provided the optional terminal cover is fitted to the instrument.